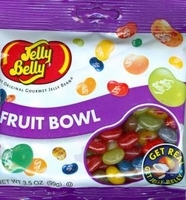 Jelly Belly Fruit Bowl mix is a bag full of nothing but the top selling fruit flavors of jelly beans. Each bag as an assortment of 16 chewy fruity flavors. You will get Sweet tasting cantaloupe, crushed pineapple, green apple, island punch and many more. Now you can have an assortment of fresh tasting juicy fruit tasting treats anytime of the year. Eat just one jelly belly for a long lasting flavor or mix a couple together and enjoy your favor fruit in one bite. There are over 80 jelly beans in this 3.5 oz bag.